This bundle combines the world’s most intuitive drum production tool with two (2) additional EZX sound libraries specifically designed for blues and vintage rock drum production. 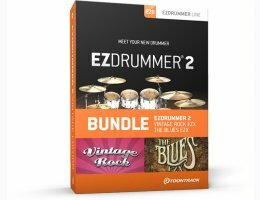 This coupled with the powerful framework of EZdrummer 2, its ’Modern’ and ’Vintage’ sound libraries and five (5) complete kits gives you the best of what drums have to offer in terms of sounds and software. EZdrummer 2 Vintage Edition includes EZdrummer 2, the Blues EZX, and Vintage Rock EZX.